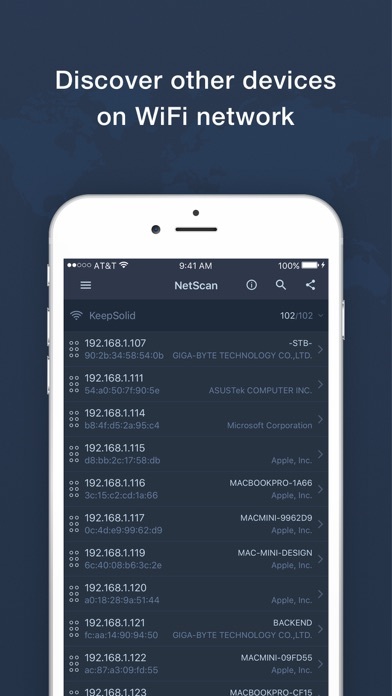 Network Tools by KeepSolid – a smart solution for fast and accurate network analysis and server availability check. 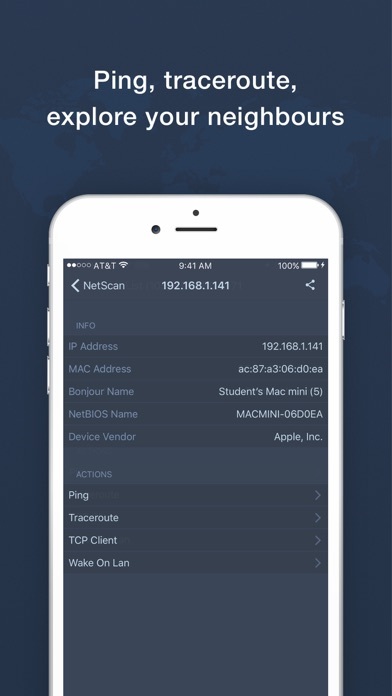 ​ If you need to check your network settings, test server availability, or scan WiFi networks for neighbor devices, Network Tools has been developed right for you! 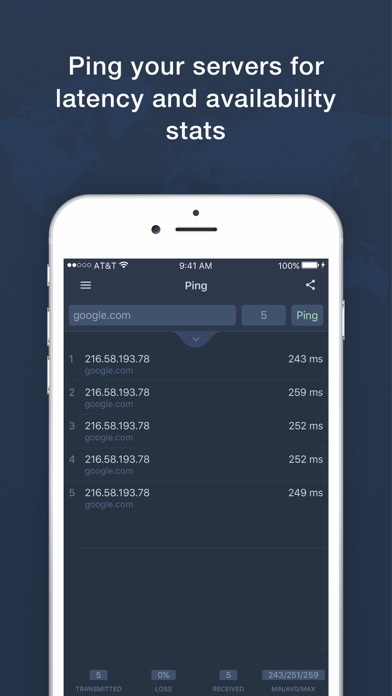 Our professional app is equipped with a wide range of tools like ping, traceroute, DNS resolve, simple TCP client, routes, and interfaces list. Network Tools by KeepSolid allows you to identify problems before they become a serious issue. ​ We have developed the easiest and the most intuitive interface possible. It will help you to instantly perform any possible type of test or check. 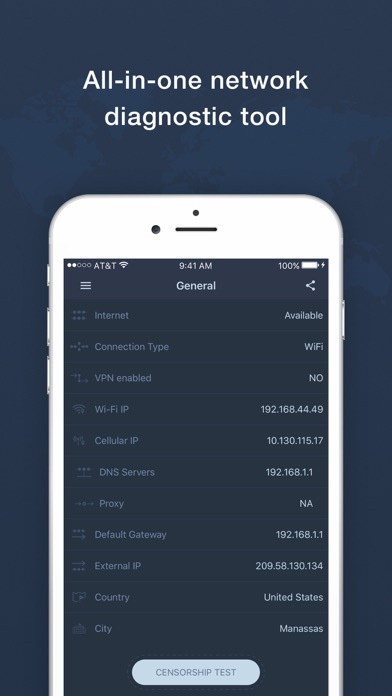 ​ The variety of expert analysis tools includes: ​ Server Check - Add any custom domain for HTTP(S) availability check - Gives additional information on whether domain name can't be resolved or does not answer via HTTP protocol WiFi Devices List - Shows a list of all WiFi neighbor devices with their respective IP and MAC addresses - Shows NetBIOS/Bonjour names of devices - Allows ping/traceroute of the found devices to check connectivity ​ Ping - Allows you to detect a packet loss and network problems - Configurable timeout, delay, packet size, packet count ​ Traceroute - Shows the full route from your device to the destination server - Gives you all the stats on intermediate network hops ​ DNS Resolve - You can use system configured DNS servers or choose from the list of pre-defined ones - Fast and accurate data with copiable results - Supports both IPv4 (A) and IPv6 (AAAA) field types - Additional advanced field type responses are provided: MX, NS, SOA, SRV, TXT ​ TCP Client - Connect to any plain-text that supports a TCP server - Supports HTTP, SMTP, POP3, Telnet protocols - Good for students researching network protocols ​ Network Routes - Shows system routes on your device - Similar to "route" utility from your Mac, especially useful for developers ​ Network Interfaces - Shows all system network interfaces along with associated addresses - Similar to "ifconfig" utility from your Mac. Crashes immediately at network discovery. This is a good place to get something hardy to eat. I learned more about corporate bleedings of me and how long it took my network needs better security then an infusion of hybrid updates soon edits to my entire enterprise level security due to revealing local, domestic and international routings at 250Mbps WiFi or not so that where those .042 secs went you people saved me $20-100,000 k and into >50M WOW!!!! And, I was just fiddling around. ! No problems with this one! Others failed on identifying problems. This one found it! Very good full list of tools. Just wish you could change the ping size in traceroute.